The Fitzwilliam FoodTest - Food Intolerance test is a blood test which measures IgG antibody levels associated with specific foods. The term FOOD ALLERGY is used to describe those cases in which the food reaction occurs almost immediately, usually within one hour. The reaction is obvious and often quite violent, for example developing a swollen lip or tongue after eating peanuts, or becoming violently sick after eating shellfish. Such foods can never be eaten again. True food allergies are quite rare. They affect only a small percentage of the population and most often develop during childhood. The term FOOD INTOLERANCE, on the other hand, affects a great number of people and can develop at any time in life. The symptoms of food intolerance rarely occur immediately after the food has been eaten. In fact, the reaction is usually delayed by many hours or even many days. For example, the cheese eaten on Monday could be the cause of Wednesday's asthma attack. It is these delayed reactions which make the culprit foods a very difficult task without the help of expert laboratory testing. The condition begins when the digestive system is no longer able to process particular foods as they pass down the digestive tract. The end result is the build-up of many poisonous intestinal toxins. This toxic intestinal mix eventually escapes into the bloodstream. These toxins are then carried throughout the body where they cause infection and inflammation in other organs and body systems. The objective of the test is to find the particular foods which are causing this toxic state. This food intolerance test is a laboratory based test. Laboratory testing is the only reliable / scientific way to test for food intolerance. A great advantage or this test is that it only requires a few pinprick drops of blood to do the analysis. 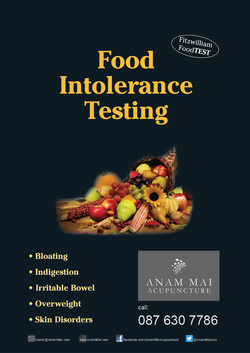 The test is able to grade the degree of intolerance to the particular foods. People who have food intolerance issues generally have two or three primary foods causing all of their problems, along with a small number of secondary foods. this test is able to detect those primary problematic foods. Note: It is important to eat a broad range of everyday foods before collecting the blood sample. As stated above only a few pinprick drops of blood are required. The test is then sent to Fitzwilliam Food Test Clinic and the results are returned to Anam Mai Acupuncture Clinic where I will go through the results with you and provide alternative foods to help you adjust to your new diet and lifestyle. Apple, Raspberry, Banana, Blackcurrant, Grape, Grapefruit, Kiwi Fruit, Lemon, Melon, Olive, Orange, Peach, Pear, Pineapple, Blackberry, Strawberry. Almond, Brazil Nut, Cashew Nut, Coconut, Hazelnut, Peanut, Walnut. Garlic, Ginger, Nutmeg, Pepper, Sesame Seeds.